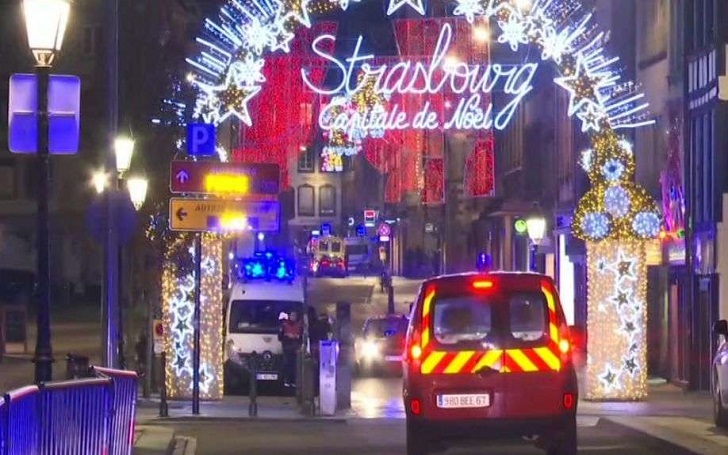 A Strasbourg, France shooting occurred Tuesday, December 11, left two people dead and at least eight others injured. The tragic incident resulted in a major security operation around a world-famous Christmas market. According to the authorities, the shooter remains at large and the shooting motive is still unclear. It's also unknown if the market was the target of the attack or the incident is just linked to terrorism. According to Interior Minister Christophe Castaner, the gunman, who has been identified, has multiple common criminal records. Several of the wounded people, who were rushed to the hospital immediately, are in critical condition. Christophe says, "Our security and rescue services are mobilized". Local authorities reportedly told the public to "avoid the area of the police station" close to Strasbourg's Christmas market. Strasbourg residents have reported on social media of hearing gunfire in some parts of the city center. Prime Minister Edouard Philippe shared a tweet regarding the incident, writing. "the situation is still underway, priority is given to security forces and rescuers." France has been hit by several extremist attacks in the past few years. A 2015 Paris shooting resulted in killing 130 people and hundreds injured, and in 2016, a truck attack in Nice left dozens of people killed.